Franco is an icon and helped change so many people’s lives. On his last trip to Africa he contracted Cerebral Malaria and passed away quietly after a short but severe illness. His work and passion for the cannabis plant helped change the world’s view and his legacy will live on for generations to come. Franco’s high risk, fast paced “full gas” career was only just taking off. He had invested all of his time, money and passion into building up a future for himself and his children, while helping other people in places like DR Congo. His children were everything to him, and he was an amazing father. Unfortunately at the time of his death, he had not yet made significant financial gains that would be sufficient support his children growing up and receiving an education. The Franco Loja Foundation is a fund held by Stichting Strain Hunters Foundation with the purpose of securing university tuition fee’s and general cost of living expenses for Franco Loja’s children Dion and Devin Lojacono until they graduate. Money is collected from donations from friends, fans, partners, businesses and organisations. The Foundation also generates money for the fund by selling products related to Franco Loja, and by collecting royalties from licensees that sell products with or related to the Franco Loja Trade Mark. After his tragic loss the world has been waiting for a strain dedicated to Franco. The strain that would represent Franco the best could only be his very last cross of two of his favourite plants: The multiple cup winning Super Lemon Haze and the famous Exodus Cheese. Green House Seed Co is donating profits from the sales of Franco’s Lemon Cheese to the Franco Loja fund. 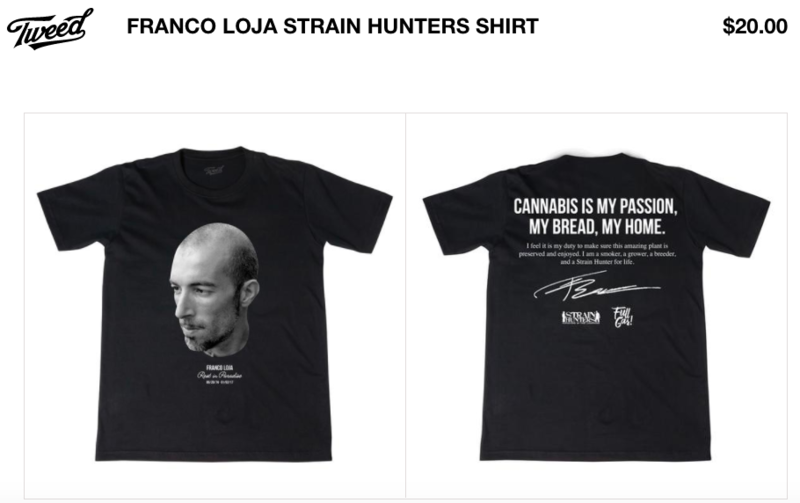 A year after his passing, we’re honouring the life and accomplishments of legendary cannabis advocate Franco Loja with a limited edition t-shirt to support the Franco Loja Fund in the Strain Hunters Foundation. These shirts are available in black or white, and come in a range of sizes for ladies and gents. Proceeds from the sale of these shirts will go towards the Franco Loja Fund, which has been set up by friends and family of Franco Loja, in order to collect donations to ensure that Franco’s children have a secure financial future. Strain Hunters Foundation continues to support Franco Loja Fund.